You shared your ideas. We’re sharing the code. The Galaxy Explorer Project is ready. You shared your ideas with the community, chose an app, watched a team build it, and can now get the source code. If you have a device, Galaxy Explorer Project is also available for download from the Windows Store for Microsoft HoloLens. Our HoloLens development team of designers, artists, and developers built Galaxy Explorer and invited all of you to be part of this journey with them. After six weeks of core development and two weeks of refinement, this app is now ready for you! You can also follow along our whole journey through the video series below. The Galaxy Explorer journey begins with the "Share your idea" campaign. The Microsoft HoloLens community is bursting with spectacular ideas for how holographic computing will transform our world. We believe the most incredible HoloLens apps will come out of ideas you imagine together. You shared over 5000 amazing ideas throughout those few weeks! Our development team reviewed the most successful and viable ideas and offered to build one of the top three ideas. After a 24-hour Twitter poll, Galaxy Explorer was the winning idea! Our HoloLens development team of designers, artists, and developers built Galaxy Explorer and invited all of you to be part of this journey with them. You can follow the development process in the videos below. In Episode 1, the development team begins the creative process: brainstorming, concepting, and deciding what to prototype. In Episode 2, the development team completes the prototyping phase – tackling hard problems and figuring out which ideas to pursue further. In Episode 3, the team starts the first week of development – creating a plan, writing production code, creating art assets, and figuring out the user interface. In Episode 4, the team dives deeper into development – bringing in scientific data, optimizing the rendering process, and incorporating spatial mapping. In Episode 5, the development team tests the app, searches for bugs that need to be fixed, and refines the experience. In Episode 7, the team completes the project and shares their code. You can find even more insights and lessons from developing Galaxy Explorer by reading the "Creating a galaxy in mixed reality" case study. We learned the building the right team is one of the most important investments we could make. We decided to organize similarly to a game studio for those of you familiar with that development model. We chose to have eleven core team members to control scope, since we had a fixed timeframe (create something cool before Build on March 30). For this project, we started with a producer, Jessica who conducted planning, reviewing progress, and keeping things running day to day. She's the one with pink hair. We had a design director (Jon) and a senior designer (Peter). They held the creative vision for Galaxy Explorer. Jon is the one in glasses in the front row, and Peter is the second from the right in the back. We had three developers – BJ (between Jon and Jessica), Mike (second row on the left), and Karim (second row middle, next to BJ). They figured out the technical solutions needed to realize that creative vision. We started out with four artists full-time – a concept artist (Jedd, second from left in the back), a modeler (Andy, third from right in the back), a technical artist (Alex (right-most person)) and an animator (Steve (left-most person). Each of them does more than that, too – but those are their primary responsibilities. We’ll had one full-time tester – Lena – who tested our builds every day, set up our build reviews, and reviewed features as they come online. Everyone tested constantly though, as we were always looking at our builds. Lena's the one rocking the leather jacket. 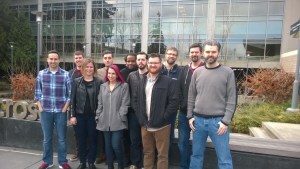 We are all a part of a larger studio here at Microsoft (think team in non-game development). There were a bunch of other people involved as well – we called on the talents of our art director, audio engineer and studio leadership frequently throughout the project, but those folks were shared resources with other projects our broader team has.